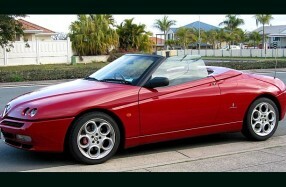 Julie Ana's Alfa Spider. Sony electronics, Polk Audio and AVI speaker components. The door woofer design/installation in this model car is horrible to say the least. Redesigned then installed Polk dB6501 split system and upgraded rear subwoofer with AVI 6" FRM. 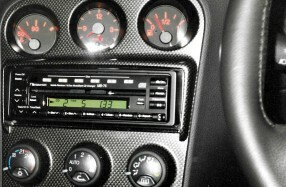 Install quality Nakamichi sound system. MB-75 6 disc/aux high powered receiver, Orion speaker components. Soundstream USA subwoofer amplifier and JL Audio 8" subs in custom made bass tubes. Nakamichi MB-100 6cd source, 6 channels of Nakamichi amplification powering Dynaudio, AVI Sound and Nakamichi speaker components. A competition winning system and to satisfy the musician owner.